Looking for a good real estate investment? 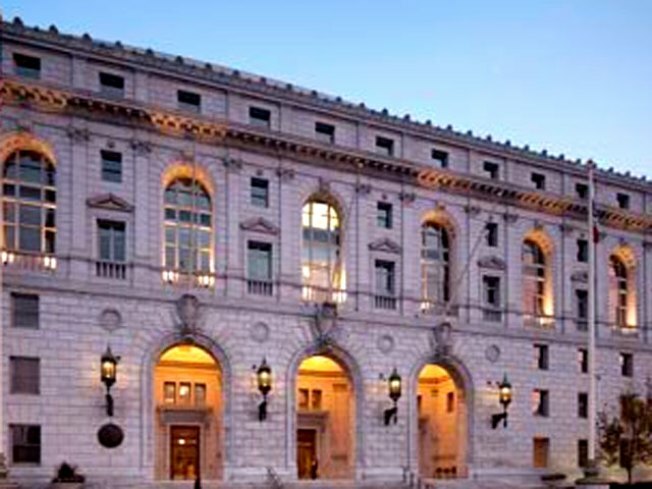 A handful of state buildings, including the San Francisco Civic Center are up for sale. Another project in San Francisco's Recreation and Park department's campaign toward self-reinvention is to open "boutique" markets for three public spaces. The areas the cash-strapped department is looking at are Civic Center Plaza, Justin Herman Plaza, and Candlestick Park. The department says the plan could collectively rake in $150,000 every year if they get installations of outdoor markets that echo the kind of handmade jewelry and whatevers that street artists sell on the Embarcadero. As with the food cart proposal for Coit Tower, Rec and Park's seeking a distinctly San Francisco vibe selling things that are, "made in San Francisco, handmade, fair-trade, organic, recycled, or re-purposed." The "curated market" means the City's visitors bureau isn't too worried about duplication of efforts at already existing markets. Meanwhile, the chairman of the street artists liaison committee (that's a thing?) seems to hint that his gang isn't necessarily psyched about the prospect of this "working harder." "They'd be selling essentially the same things we are," he said. "We would like them to rescind this." That's because the request for proposals has already gone out, and like the Coit Tower proposal, is only waiting for enterprising business owners to show up.